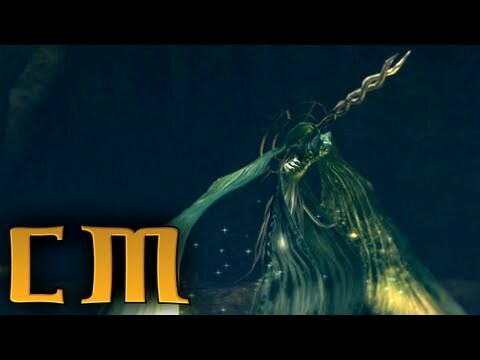 The Moonlight Butterfly is the boss of the first area of the Darkroot Garden. It can be found at the top of a moss covered staircase past the sleeping Stone Giants. The battle takes place on a long stone bridge with the Moonlight Butterfly flying next to it. 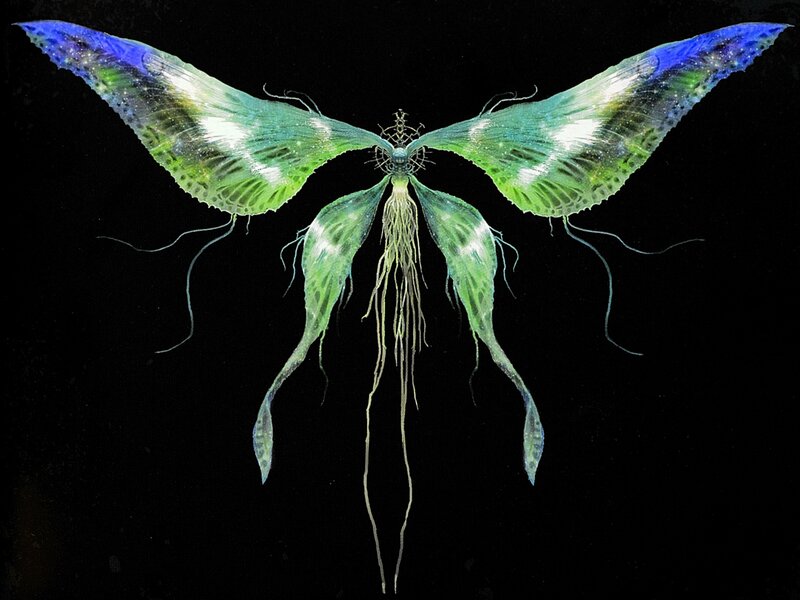 Unlike most battles, much of its combat is purely ranged and one-sided; the Moonlight Butterfly will keep its distance from the bridge for a majority of the battle and simply fire projectiles at the player. Energy Bomb: After the Butterfly's health drops beyond 50%, its attacks start becoming faster. It will charge and release a big blue energy bomb, in the direction its horn is pointing, when it hovers on top of the bridge. Hard to block, move behind the butterfly to dodge it. Ray Beam: Rarely used, from its usual position, it charges, and shoots a continuous beam of energy from one side of the bridge, to the other. Can be dodged by rolling through the beam. Face Bomb: The Butterfly will rest its head at the side of the bridge to drink nektar, which also replenishes its health by about 50 HP. Before it moves back to flying position, it charges up and causes a small explosion. Move away from it as it starts charging. 1) Target the Butterfly and strafe with it, keeping it as directly in front of you as possible (as in, always be facing one of the walls of the walkway with room to walk sideways). You've got leeway, but you need to be able to roll to your sides in order to dodge its attacks. 2) When it starts to charge an attack, roll just before it releases the attack. Roll again immediately if necessary (I like to roll back toward the direction from which I rolled the first, but it's not terribly important - just keep up with The Butterfly). Repeat. 3) When it's the beam attack, press up against the wall closest to the Butterfly and roll once the beam nears your position (you gotta time it right, but if you do you should roll right under it). 4) When it lands, beat it to a pulp. Avoid it's explosive attack, which should be easy as it charges up for a while. Repeat this every time it lands, obviously. 5) When it flies over you hide behind the door you came in. You're going to need some type of bow and a ton of arrows. Without a high amount of dexterity, this method of battle will be a long and tedious one. If you have the Sunlight Spear miracle, a few strikes will make this fight easy as pie. Sorcerers should have no problem with this boss either. A shield with good magic resistance can be used to block the small energy spears with little damage; The Crest Shield from the Nameless Knight after returning to the Northern Undead Asylum is a constant drop. Ironically enough the Crystal Ring Shield is ideal for this fight because it has awesome magic resistance and is very light. Proceed across the bridge, and scale the tower to pick up the Divine Ember, the Watchtower Basement Key and a Homeward Bone from the petrified blacksmith.